Generals in the American Civil War (1861 - 1865) often used the tactic of frontal attacks using large number of men to overwhelm the defenders, on the basis that it took time for each of the defenders to reload, and in that time, the surviving attackers could reach and grapple with the enemy. What the defenders needed was to increase the firing rate, and the critical issue was the time taken to reload. One of the drawbacks of a fast-firing weapon was the heating effect of the burning gunpowder, which caused the breech to expand and fail to seat properly. In order to solve this problem in 1862, Gatling took the idea of a preloaded steel cartridge-chamber and arranged for six barrels to rotate about a central spindle, with each barrel firing as it came to the 12 o'clock position in its travel, and for five-sixths of its life it was cooling between shots. [G1]. The first six Gatling guns were built at the end of 1862 at the works of Miles Greenwood Foundry & Machine Works of Cincinnati, Ohio. Before they were delivered the factory, patterns and guns were destroyed by a fire. Production resumed at the Cincinnati Type Foundry in 1863. Thirteen Gatling guns (Second Model 1862) were manufactured, and 12 purchased by Major General Benjamin Butler (the last was bought by Admiral David Porter). [G3]. The animation shows the first model of 1862, where the steel cartridge-chambers were loaded with the paper cartridges used by the .58 musket then in use. These were cumbersome to load, and needed a percussion cap to be fitted to the rear of the chamber. However, when production resumed in 1863, Richard Gatling had recognised the value of the .58 rimfire metallic cartridge, and these bullets were fitted into the steel cartridge-chambers. General Butler (apparently) used his Gatling guns to good effect during the Union's siege of Petersburg, Virginia. 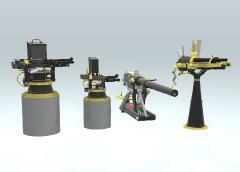 However, political issues intervened and Gatling did not sell any further guns during that conflict. By 1865, Gatling had completely redesigned his loading mechanism, to take advantage of the metallic cartridge. In his 1865 model the rimfire cartridge was loaded into a chamber in the rear of each barrel, dispensing with the steel cartridge-chambers. The basic principle of loading several barrels in sequence with a metallic cartridge has endured since 1865, and is still in use today. In 1862, Richard J Gating patented a gun capable of rapid fire. It was not the first such gun, but has proved to be the most enduring. 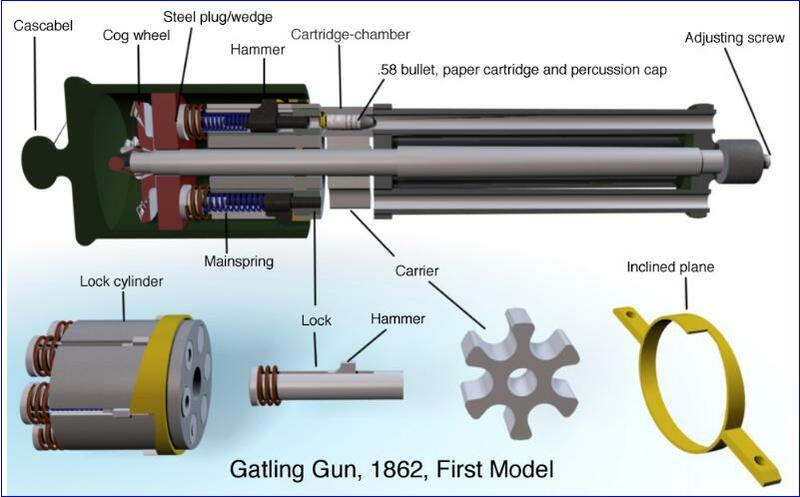 This page looks at Gatling's first design, which used a hopper filled with steel tubes pre-loaded with the paper cartridges currently in use during the American Civil war. The animation is based on Gatling's patent of November 1862 [G4], but it is recognised that the second model, which saw actual action, used rimfire metallic cartridges. The key to the 1862 Gatling gun was a steel cartridge-chamber which contained the force of the explosion of the gunpowder charge. Unlike the Ager cartridge, the Gatling cartridge chamber was not pushed into the rear of the barrel, instead cartridge-chamber had to be aligned and forced tightly against the rear of the barrel at the instant that the charge was ignited. 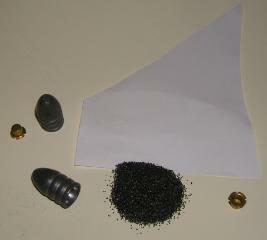 In the 1862 (First model) the steel cartridge-chambers used the same paper cartridge as used in the infantry Springfield and Enfield rifle muskets - a .58 Minie rifled bullet powered by 65 grains of gunpowder wrapped in a paper cartridge and ignited by a percussion cap that was fitted to the rear of the cartridge-chamber. With a good stock of pre-loaded cartridge-chambers, the gun could produce a high rate of fire. The fired cartridge-chambers would then be reloaded. The second model, which was used operationally by General Butler, used metallic cartridges which were easier to load into the cartridge-chamber tubes. The Gatling gun consists of an assembly of six barrels, a carrier, lock-cylinder and cog wheel all fixed to a central shaft so that they rotate together when a pinion wheel is turned by a hand crank on the right rear side of the gun. The lock-cylinder is bored to hold six locks that are free to move within the lock cylinder. Each lock contains a spring-loaded firing hammer, which has a tenon extending up through a slot in the lock cylinder and which rests against a ring cut with an inclined plane (yellow in diagram). As the assembly is rotated the carrier picks up a loaded cartridge-chamber from the hopper. Then, as the assembly approaches the top-most point (the 12 o'clock position) the tenon on the firing pin is pushed back by the inclined plane, thereby compressing the firing spring. The solid bulkhead (red) at the rear of the lock cylinder is made strong enough to absorb the recoil from each shot. A steel plug or wedge (green) is fitted into this bulkhead so that when the lock approaches the 12 o'clock position, the rounded rear of a lock rides up on the wedge, and the lock moves forwards. As it does so, it pushes the loaded cartridge-cylinder hard up against the rear of the barrel to make an (almost) gas-tight seal. The hammer is released, and it moves forward to strike the percussion cap (or in the second model, to crush the rim of the rim-fire cartridge) and the round is fired. 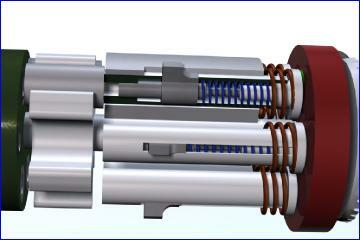 As the assembly continues to rotate, the lock moves off the plug and is withdrawn by a spring. A second inclined plane is cut into the ring to pull the hammer back to disengage it from the rear of the cartridge-chamber. 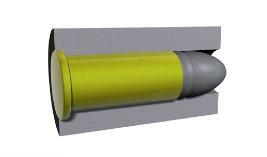 This leaves the fired cartridge-cylinder free to fall from the carrier to the ground. In case it sticks, a pair of arms, or comb, are attached on the left side of the frame to force it out of the carrier. a. the cartridge, both paper and metallic, is contained in a cartridge-chamber, which is strong enough to withstand the explosion of the powder. b. the cartridge-chamber is pushed up hard against the rear of the corresponding barrel by the steel plug just before firing. The screw at the front of the frame is used to adjust the longituinal position of the barrels to ensure a tight fit. The shock of the recoil is transmitted through the lock and steel plug to the strong bulkhead. c. In the 1862 model, the mechanism fires the uppermost barrel - i.e. the barrel at the 12 o'clock position is fired. In later Gatling guns, from the Model 1865, it is the barrel at the lowest point of travel, the 6 o'clock position, that is fired. Two views of an 1862 Gatling gun (second model). Note the chute under the breech to divert empty cartridge chambers to the left, where they can be collected and reloaded.